Donegal’s highly-rated manager has a huge passion for his role according to one of his squad members. 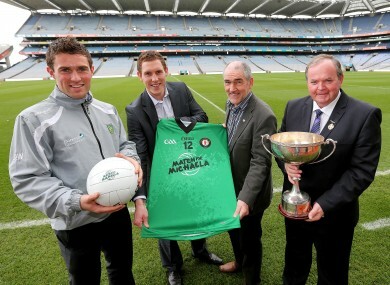 Declan Walsh (left) pictured at the launch of Match for Michaela in Croke Park yesterday. DONEGAL FOOTBALLER DECLAN Walsh is confident that manager Jim McGuinness will remain at the helm of the All-Ireland champions despite speculation that he may attract the interest of rival codes following his recent coaching achievements. Celtic boss Neil Lennon is amongst those who have expressed admiration for the Glenties man yet Walsh believes the passion McGuinness has for his county’s football side will be a decisive factor. “If you know Jim, the passion he has for football and for Donegal football in particular, it’s unbelievable. He’s just got that passion and hunger. He seems to get the best out of all the players. Donegal embarked on a whirlwind celebratory tour of the county last week as they visited towns and villages with the Sam Maguire trophy. Walsh admitted the homecoming in his native parish of Malin, high on the Inishowen Peninsula, was something to savour. “The county went mad up there. In some towns we were two to three hours late but there was so many people there and so many smiles on faces. Myself, Ryan Bradley and Tommy McKinley are all from Inishowen. Traditionally, it would have been a soccer area but there’s a couple of clubs have made senior championship. Walsh, who works in Dublin, is a former DCU student where he rubbed shoulders with the likes of Bryan Cullen and Paul Flynn. He is hoping that Donegal can build on this season’s success and after being mainly employed as a substitute in 2012, is aiming to making a breakthrough next year. “If you knew Jim, that hunger will definitely be there. I know the lads once they get a taste of success, they’ll want it again next year. Within the squad there’s unity but there’s also great competition for places. Email “Walsh confident of McGuinness staying in charge”. Feedback on “Walsh confident of McGuinness staying in charge”.